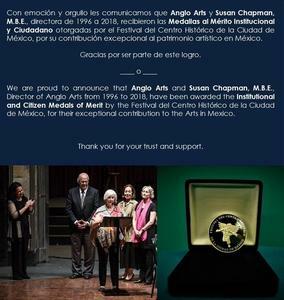 Anglo Arts was awarded the Medal of Merit by the Festival del Centro Histórico de la Ciudad de México (Festival of the Historical Centre of Mexico City). Anglo Arts and Susan Chapman, director from 1996 until 2018, accepted the Medals to Institutional and Citizenship Merit awarded by the Festival del Centro Histórico de la Ciudad de México with great pride and emotion. The festival awards this Medal of Merit annually since 1998 to recognize people and institutions "whose actions have exceptionally contributed to rescue and dignify artistic heritage in Mexico". Through this recognition, the festival highlighted the strong alliance that has united our institutions for more than twenty years, and stressed that there is no other cultural organization in Mexico that supports the production of artistic events at this level with such strength as that of Anglo Arts. This year, Anglo Arts’ participation with the Festival del Centro Histórico consisted in bringing to Mexico for the first time the Clare College Choir, Cambridge, considered internationally as one of the world-wide leading choirs at university level. Founded in 1972, it is comprised of 30 students from Cambridge University. In addition, its Musical Director since 2010, Graham Ross, is much sought-after for the worldwide reputation of his work, as well as his extensive musical repertoire as a 33 year-old composer. Having studied himself at Cambridge and at the Royal College of Music, he made his debut as guest director of the London Philharmonic Orchestra in November of 2018. The Choir presented three concerts for the Festival del Centro Histórico: two with the Orquesta Sinfónica Nacional, under the baton of guest conductor Rebecca Miller, at the Palacio de Bellas Artes, the most emblematic venue in the country, and one a capella at the Anfiteatro Simón Bolivar, Antiguo Colegio San Ildefonso, the hall that is home to the first mural by Diego Rivera, La Creación, painted in 1922. These concerts were enjoyed by more than 2,000 spectators, and the programs included some of the best-known baroque choral singing of the sixteenth century, all the way to traditional English-speaking chorales, which paid homage to nature, the seasons of the year, and to music itself. At the a capella concert, the Choir included colonial spiritual songs of the eighteenth century, and blues, such as George Gershwin's Summertime that Graham Ross adapted especially to a choir version. In the following weeks, the a capella concert that was presented in the Anfiteatro Simón Bolívar will be broadcast in its entirety nation-wide on channel 22, reaching 100,000 television viewers. The wealth of English choral tradition is well known globally, because these works were written for the great cathedrals of the United Kingdom. They continue to be sung there, for example, in the cathedrals of Gloucester and Salisbury. For this reason they are considered as the best in the world, in addition to the fact that they are taught beginning at primary school and are kept much alive at all artistic levels. The fact that it was possible to bring this choral group to Mexico, to be presented in one of the most important international festivals reinforces the commitment that Anglo Arts has with launching and promoting British culture in Mexico. This commitment would not be possible without the common efforts of The Anglo Mexican Foundation for fostering stronger ties between Mexico and the United Kingdom. However, the recognition made to us by the Festival extends to all the areas of the Foundation, whose tireless work makes it possible for Anglo Arts to be considered and awarded as one of the main cultural institutions of Mexico. This institutional strength is what outlines The Anglo Mexican Foundation and its different areas from other institutions of English language teaching in Mexico, offering a wide and varied approach to the different aspects of British culture to its community.